Star Wars tourism has been a big industry ever since George Lucas first transported audiences to a time long ago in a galaxy far, far away. Like many modern blockbusters, the original sci-fi trilogy utilized shooting locations all over the globe to create otherworldly landscapes, cities and planets, and a lasting effect has been fans traveling thousands of miles from their homes to visit the specific spots themselves. For years the concept has brought people to places like Tunisian desert (where Tatooine was first created), Finse, Norway (Hoth in The Empire Strikes Back), and Tikal National Park in Guatemala (Yavin 4 in A New Hope), but now Ireland is ready to become the next big hot spot. For the creation of the planet Ahch-To in both Star Wars: The Force Awakens and Star Wars: The Last Jedi, J.J. Abrams and Rian Johnson brought their respective productions to the island nation, and utilized the breathtaking sites to create the stunning, isolated home of the legendary Luke Skywalker. It was an incredible choice, as locations like Skellig Michael and the Dingle Peninsula offer up an endless bounty of awe and amazement — and I can say that with real authority because I had the chance to experience them first-hand last month. 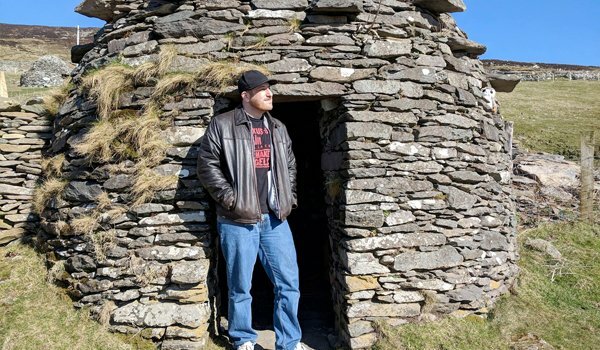 In celebration of Star Wars: The Last Jedi‘s arrival on Blu-ray, DVD, and digital HD, I joined a small group of other reporters traveling to Ireland back in mid-March, and during a week-long trip dove headfirst into the world of Star Wars. From celebrating St. Patrick’s Day with Mark Hamill, to visiting the site of the green milk-spewing Sea Cow, it was an unforgettable experience, and – thanks to lasting memories and a 360 degree camera – one that I will take you back to below and across the next few pages. There admittedly isn’t inherently anything that directly links the histories of Star Wars and St. Patrick’s Day, but it does make for a wonderfully splashy start for this story. With the home video release of The Last Jedi scheduled for March, the timing for the trip happened to line up perfectly with the famous Irish holiday, allowing the press group to spend our first full day in the city of Dublin enjoying the raucous festivities. Of course, it should also be noted that the celebration did have an important link this year to the beloved sci-fi saga, as Mark Hamill was honored as the Grand Marshal of the annual parade. Sitting in the media tent on O’Connell Street Lower (straight-up freezing – admittedly due to personal failure to properly pack for the trip), I had the exceptional experience of actually watching Dublin’s St. Patrick’s Day Parade, and captured a great deal of it using our 360 camera. At the start of the video above you can watch Mark Hamill’s arrival to the event, sitting in the backseat of an old fashioned car and getting the crowd riled up, but stick around for some of the weird, wild and fun floats and performances that proved equally entertaining.